Reverend John H. Grier, the "Marrying Parson." In 1840 the members of the Pine Creek congregation built a house for public worship in the village of Jersey Shore, and the congregation was afterwards called the Jersey Shore Presbyterian Church. John H. Grier served as a Presbyterian minister to the Jersey Shore area from 1814 until his death in 1880 and during that time he is believed to have officiated the marriages of over 600 couples along with being married four times himself! Reverend Grier resigned the pastorate of Jersey Shore Presbyterian Church in 1848, but continued to supply the congregation in Nippenose Valley until 1863, when he withdrew from the active duties of the ministry. Rev. Grier died February 3, 1880, within four days of his ninety-second birthday. Jersey Shore Presbyterian Church, Jersey Shore, PA, undated. These original records of John H. Grier, once held by the Presbyterian Church of Jersey Shore, were copied in 1915 and are now known as the "Grier Marriage Records." PHS holds copies of those records, as well as original marriage records of the Jersey Shore Church beginning in 1849. 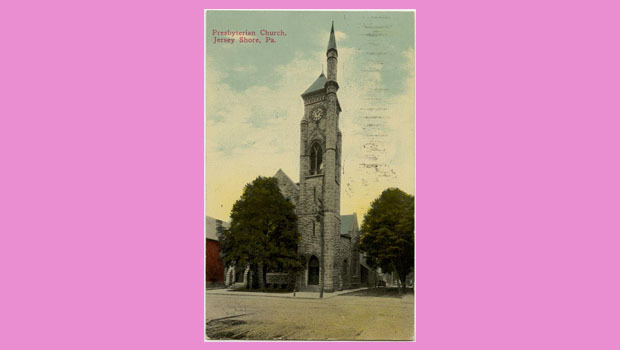 For more information about these records see our CALVIN online catalog: Presbyterian Church (Jersey Shore, Pa). 2 hours 6 min ago. Happy #EarthDay from the Presbyterian Historical Society! Here is an image of the very first Earth Day in 1970 that comes from our collection of Religious News Service photographs. To view this image and read about the Presbyterian Church and it's involvement in environmental causes over the years, visit https://buff.ly/2GznHvN.